One of the Pacific Northwest’s hidden societies, GEIST & THE SACRED ENSEMBLE forge a doom-inflected folk ritualism; dirges tinged with Eastern psychedelia and meandering meditative trances. For the last several years, the group has shown the Washington state underground a clear vision for their sound and lyrics – creating a shamanistic space for the listener, placing them into a trance, then building up the excitement.The overarching theme of their lyrical work is that of an idealist, a yearning for an end to the modern human condition, for destruction of the constructs & constraints of oppression. The group has appeared many times at Thirst For Light and on Hollow Earth Radio. 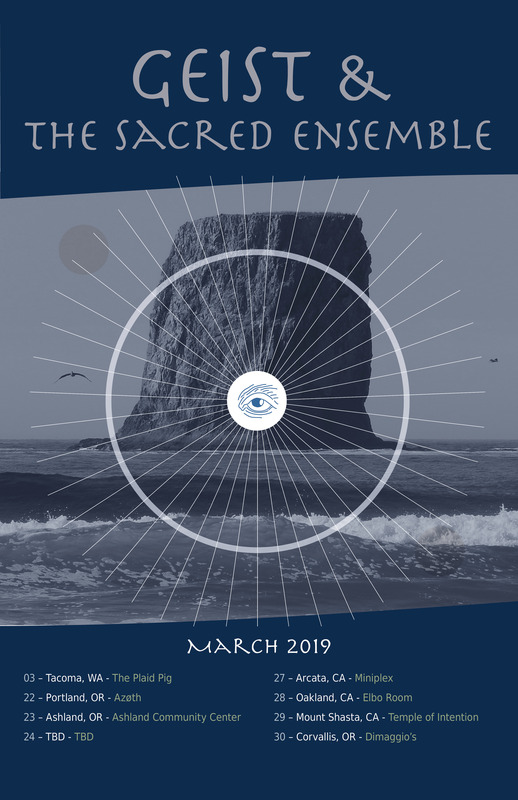 GEIST & THE SACRED ENSEMBLE bring their hypnotic and emotionally charged live show to a wider audience this spring with a West Coast tour.